This week and the past week. I thought I wouldn't be able to survive. For the first time, I had a week long leave in the middle of the year. While others would be more than thankful for the opportunity, I have a different story to tell. I admit, this is not my best time. The past days and the coming days will mean one thing: struggle. I cannot wait for the day when I can finally say, 'twas over. I can only wish for better days. 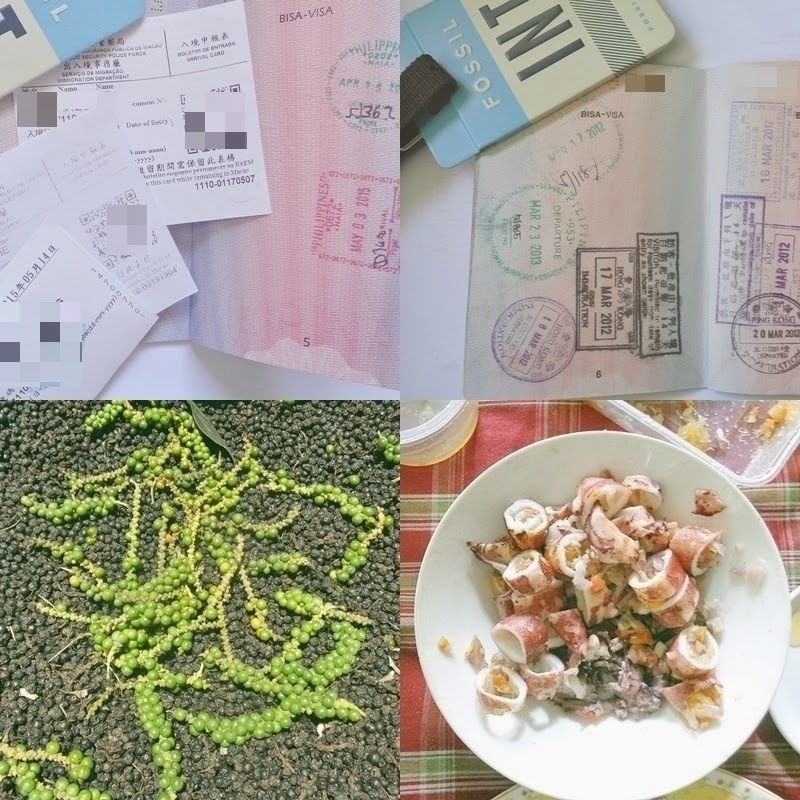 Beautiful Mess - I always find a beautiful mess on excessively stamped passports. My first passport (right) already expired and had four countries and stories to keep. On my last trip, I was quite surprised with the new practice in Hong Kong and Macau. No more stamps! I was instead issued pieces of papers that contained all the immigration details. No more beautifully messy passports :( All I have are those pieces of vulnerable thermal papers, whose printed information will surely be erased in a few weeks. All natural pepper from Father - The idle parcel of land owned by my Auntie has become the venue of my Father's favorite past time. He has been engaged to some planting activities. I believe a significant part of what we have at home came from my Father's green thumb. :) Yes to organic and healthy living. Stuffed Grilled Squid - Thank you to my Mother for giving in to my request. The lonesome daughter is more than happy to be spoiled. Handmade! - Thank you Marieken for this card. Beatles Inspired Card by Hallmark - Thank you Leah! And yes, I'm always happy receiving something from you and Mother E! Addiction - Why does Cath Kidston rhymes with addiction? ;) This was such a great deal. Thank you Leah for conniving. #NgitingTagumpay #PasswordProtected Hahahaha I want to see your loot too. 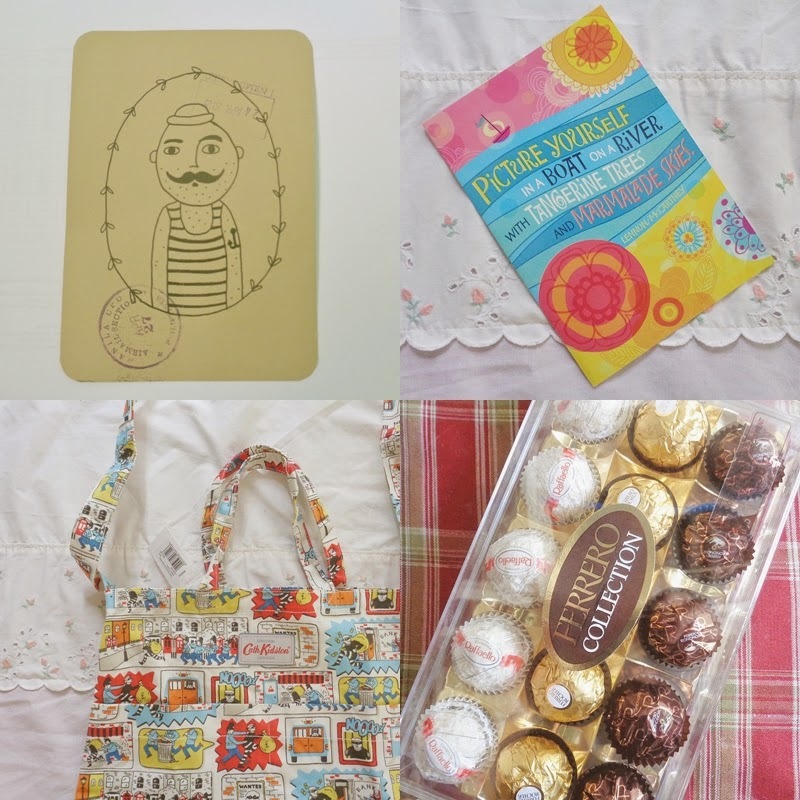 Ferrero Collection - Perks of being a good neighbor! Hahahaha Not me, but my parents. I love it that we live in a community where my parents are still familiar with families in the neighborhood. But I believe, there is something wrong with me when I don't feel "tempted" with this "temptation." Life... and all the grown up issues! And because I was home the entire week, I was able to catch up with Asia's Got Talent. Sporty Spice!!! - I was more than happy when I discovered that Mel.C was one of judges at Asia's Got Talent. My only regret, I missed several episodes of the first season. My wish is that there will be Season 2 soon and please, retain the same set of judges. David Foster, Vanness Wu, Anggun and Mel C. (yes I still prefer calling her Mel C. than Melanie) were the best for me. And another request, please don't remove Rovilson Fernandez and my crush, Marc Nelson!!!! Pinoy Pride!!! -El Gamma Penumbra for the win! I BEG YOU! Please watch this. You will never regret it, more so if you are having a bad day. What caught my attention is the stuffed squid. Does your mom cook the stuffed squid and then slice it? What is in the stuffing? We like squid at our house, also called calamari. Cute ng fresh peppers! Gusto ko rin ng gardening kaya amazed na amazed ako pag nakakakita ng mga organic produce. Magagalit sa iyo si Atty Topacio. Hekhekhek! ang cute nung performance nung AGT judges sa grand finals. i actually enjoyed it kahit ang lakas maka-reklamo nung mga tao sa social media na kesyo bakit sobrang auto-tuned daw. tsk, tsk! Aliw na aliw ako sa Miss Tres. Sobra. Ilang beses ko na ito pinanood. Lovely blog. El Gamma's performance is extremely touching. That Cath Kidston bag is a catch! Hi Diane! Sorry late reply na naman ako. Winner talaga ang bag mo. I'll feature my CK bag soon. I think last ko na yun (eto na naman ako, haha!). Kse ubos na budget sa Mansur hehehe! Btw, thanks for sharing the Miss Tres video. Grabe, 3 nights in a row ko na yata pinapanood ito haha!